Grilled salmon with avocado salsa. The 2014’s last week starts today! How are you doing with your projects and plans? Have you already thought about your New Year’s Resolutions? 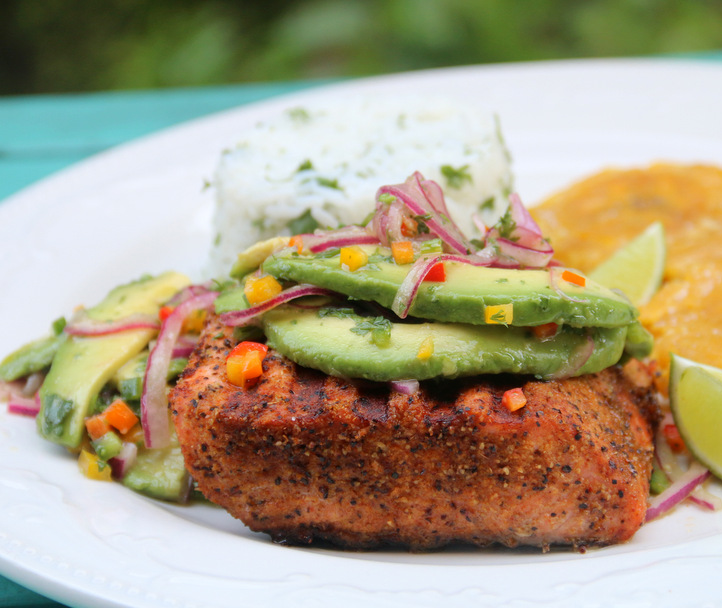 Today’s recipe is ideal if you want to welcome the New Year with an original food: Grilled salmon with avocado salsa. Sounds yummi? Yield: 4 – 6 diners. Serve the salmon topped with the avocado salsa, and with rice and thick green plantain chips on the side. You can also prepare this with other varieties of fish, including tuna, sea bass, cod, etc. I hope you enjoy this, please share pictures of your plate already served.